TODD, Mary Fidelis. Song of the Dove. The Story of Saint Catherine Labouré and the Miraculous Medal..
(Heussen, H. van). S. Willibrordus seu Clemens, Primus Ultrajectensium Archiepiscopus. Obiit A0 736. Sepultus Epernachi..
Lescure, M. de. Jeanne D'arc l' héroïne de la France..
(Heussen, H. van). S. Lebuinus Transisalaniae Apostolus...obijt Ao 785, sepultus Daventriae..
Cave, William. Apostolici : or, the History of the Lives, Acts, Death, and Martyrdoms of those Who were contemporary with, or immediately Succeeded the Apostles. Also the most Eminent of the Primitive Fathers for the First Three Hundred Years. The Fourth Edition Corrected..
(Heussen, H. van). S. Marcellinus...Evangelium praedicavit: deinde Oldenzaliam, Covordiam, Daventriam, et advicina loca profectus..Oldenzaliae defunctus et Daventriae sepultus est..obijt circa Annum 768. 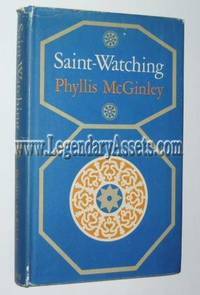 From Saint-Watching to The Incorruptibles a Study Of the Bodies Of Various Catholic Saints, from	Saint-Watching to The Incorruptibles, we can help you find the saints books you are looking for. As the world's largest independent marketplace for new, used and rare books, you always get the best in service and value when you buy from Biblio.com, and all of your purchases are backed by our return guarantee. Vintage, 1998-12-29. First Edition. Paperback. New . New Softcover Book with a remainder mark on the bottom page ends. Sheed & Ward, 1948. Hardcover. Very Good. Vintage Collectible Hardback Book of 404 pages covering 60 Saints for Boys. This is a Classic and Hard To Find. Book is in Very Good condition with a tight binding and mostly clean crisp pages. There is a name/address sticker in the upper left hand corner inside the front cover. No other writing or marks inside the book. Outside cloth covers show some minor soling and wear to the outside corners and edges. There is a tear along the bottom of the outside spine which appears to have been glued. A classic! Antwerpen., Joh. Verdussen., 1733. Engraving, folding, 47 x 30 cms, by Fred. Bloemaert after Abraham Bloemaert. leaf from an edition of Historia... Ultrajectini 1733. Short Latin text at the bottom. Begraven te Utrecht. KEYWORDS: Saints. London: J.M. Dent & Sons Ltd, 1977. 1st Edition. Hardcover. Near Fine/Very Good. 8vo (medium). 248 p.p. illustrations and 5 maps. Light rubbing to jacket and inner flaps. Some sporadic scuffing to covers. Light sunning to head and edges of rear cover and head of inner flaps. Boards clean, stiff. Slight bump to head of spine. Front board slightly bowed, otherwise near fine. TAN Books, 1993-04-01. Paperback. New . New Large Softcover Book of 304 pages. Boston: A Bulfinch Press Book. Little, Brown, and Company, 1993. First Edition. Hardcover. Near Fine/Fine. 8vo (imperial). , 279 p.p., 105 colour illustrations.Pictorial endpapers of angels. Light rubbing to jacket. Small white stain on jacket spine, partially affecting text. Boards tight. Pages crisp, clean. In near fine condition. Oxford University Press, USA, 2009-02-15. Paperback. New . New Softcover Book of 311 pages. Cork: Cork University Press, 1995. Soft Cover. Very Good. 8vo. xvi, 268 p.p.,  leaves of maps and photographs, including many in-text photos. Lightly bumped edges, signs of wear along fore-edge, but in very good condition. This book combines factual and social analysis about monks in Ireland between a.d. 800-1200. Chapters include The Politics and Hospitality. Saints, Kings, and Social Order, The Monastic Enclosure, Spirituales Medici, and more. New York: Limited Editions Club, 1930. Hardcover. Tasteful bookplate on the front pastedown; slight sunning to spine. Slipcase with dampstaining to back edge. A Near Fine example of this beautifully printed book in a Very Good slipcase. Paoli Molnar. Quarto (8-1/8" x 11-5/8") bound in cloth specially woven in blue and tan by Fortuny of Venice. The first English translation of 1864 revised by Dom Roger Hudleston. Designed and printed on deckle-edge mold-made paper by Hans Mardersteig at the Officina Bodoni in Verona, Italy. Illustrated with wood engravings by Paoli Molnar. Copy #4 of 1500 SIGNED by the illustrator on the colophon page. Copies of LECs with such a low limitation number are rather uncommon. Tan Books & Publishers, 1999. Paperback. Like New. Books are New, but had the price written in pencil in the upper right hand corner of the first page and show some outside cover wear. Books are unread. Chicago: Loyola Press, 2005. Soft Cover. Fine. 12mo. xiv, 606 p.p., plus 1 p.p. ads. Light wear to edges, and light bump to head of spine. In fine condition. Antwerpen., Joh. Verdussen., 1733. Engraving, folding, 47 x 30 cms, by Fred. Bloemaert after Abraham Bloemaert. From an edition of Historia... Ultrajectini. Short Latin text at the bottom. overleden: 784. Begraven te Utrecht. KEYWORDS: Saints. Antwerpen., Joh. Verdussen., 1733. Engraving, folding, 47 x 30 cms, by Fred. Bloemaert after Abraham Bloemaert. From an edition of Historia... Ultrajectini, 1733. Short Latin text at the bottom. sturf te Westervoort. Begraven te Elst. Wort geviert 27 Augustus. KEYWORDS: Saints. TAN Books, 2013-01-24. Paperback. New . New Softcover Book of 67 pages. Refuge of Sinners Publishing, Inc, 1900. Paperback. New . Softcover Book of 112 pages. Notes to Serve For the History of St. Philomena and Manual of the Arch-confraternity. Translated from the French by Agnes Sadlier. Imprimatur 1900. The writer states that he "differs from most historians in refusing to recognize as canonical the pretended revelations in regard to St. Philomena...Imitating the wise reserve of the Church, he will state legends merely as legends, and he feels sure that the love of the faithful for St. Philomena will not be lessened." Contents of this book include chapters on: The Christian Cemeteries, Invention of the body of St. Philomena, Invocations to St. Philomena, The Cord and Chaplet of St. Philomena, Mass of St. Philomena, Prose, Hymn and Canticles, etc. TAN Books, 2014-08-28. Paperback. New . Signed By the Author at the Immaculate Heart of Mary National Homeschool Conference in Fredericksburg, Virginia on June 20, 2015. New Softcover Book of 265 pages. Foggia, Italy: Padre Pio of Pietrelcina Editions, 1990. Second Edition. Soft Cover. Very Good. 12mo - over 6¾" - 7¾" Tall. 222 p.p., with numerous b/w illustrations and photographs of Padre Pio throughout. Light soiling to front and rear covers, edges slightly bumped. Otherwise in very good condition. Antwerpen., Joh. Verdussen., 1733. Engraving, folding, 47 x 30 cms, by Fred. Bloemaert after Abraham Bloemaert. From an edition of Historia... Ultrajectini. Short Latin text at the bottom. Tweede bisschop van Utrecht. Werd te Dokkum omgebracht. Begraven te Fulda. KEYWORDS: Saints. New York: Limited Editions Club, 1930. Hardcover. A Fine example of this beautifully printed book in a Very Good slipcase with a split at the top edge. Paoli Molnar. Quarto (8-1/8" x 11-5/8") bound in cloth specially woven in blue and tan by Fortuny of Venice. The first English translation of 1864 revised by Dom Roger Hudleston. Designed and printed on deckle-edge mold-made paper by Hans Mardersteig at the Officina Bodoni in Verona, Italy. Illustrated with wood engravings by Paoli Molnar. Copy #1222 of 1500 SIGNED by the illustrator on the colophon page. Saint Benedict Press W/Tan Books and Publishe, 2010-04-01. Paperback. New . Brand New Softcover Book of 175 pages. TAN Books, 2013-09-28. Paperback. New . New Softcover Book of 261 pages. Pekin, IN : refuge of Sinners Publishing, Inc. , 2011. Paperback. New . Originally published in 1942. New softcover book of 127 pages. This book of sermons is written for priests, in particular for those who conduct the weekly novena of the Miraculous Medal. Since usually the exercises of the novena do not last more than half an hour, the sermon must not be longer than ten minutes. To meet this need, the present volume of sermons is published. The purpose of these sermons is to assist the preacher by suggesting points that each one may indeed develop in his own personal way. Imprimatur 1942.